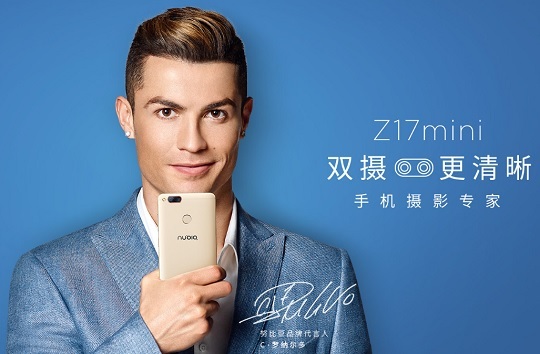 Accompanied by professional footballer Cristiano Ronaldo, ZTE has officially unveiled the new Nubia Z17 mini with a dual camera setup and up to 6GB of RAM. The new Nubia Z17 mini sports a metal unibody design with a 5.2-inch display that uses an LTPS panel. It is equipped with a pairing of two 13-megapixel rear cameras, one for monochrome and one for color. Flip it over and you'll find the 16-megapixel front snapper. Inside its thin shell emerges the octa-core processor and impressive memory. For the high-end version, there goes the Qualcomm MSM8976 Pro Snapdragon 653 chipset with 6GB of RAM. Meanwhile, for the standard version, there's the Qualcomm MSM8976 Snapdragon 652 chipset with 4GB of RAM. Both variants have 64GB of internal storage that can be expanded up to 256GB via a microSD card. The ZTE Nubia Z17 Mini is available in black and gold colors and currently priced in China at CNY1,699 (about Php12.3K in direct peso conversion) for the standard version and CNY1,999 (about Php14.5K in direct peso conversion) for the high-end variant.